THREE suspected drug personalities who allegedly engaged with the police operatives in a drug raid in Laguindingan, Misamis Oriental, Friday, March 15, died shortly after the armed encounter. 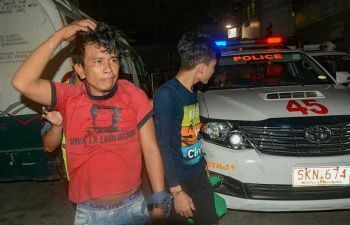 Killed were certain Dodong “Dongpings” Pindulangan of Sinai, Laguindingan town and his two companions identified as Runkle John Lago and alias Carlo Dagondon, residents of Cagayan de Oro City. Combined elements of Laguindingan, Alubijid, and Libertad town police and Provincial Drug Enforcement Unit (PDEU) raided and searched the house of Pindulangan by virtue of a search warrant issued by a court in Manticao town last March 8. But, the operation turned bloody when Pindulangan and Lago allegedly fired their guns while Dagondon reportedly tried to throw a hand grenade at the operating team, forcing the authorities to return fire. Police said no one from their side was wounded while all three suspects succumbed to gunshot wounds to their bodies. Suspects were rushed to the hospital but were declared dead on arrival. The Scene of the Crime Operatives (Soco) recovered from the encounter site a black widow revolver, 9mm Machine pistol and fired bullets. Investigators also recovered from the suspects’ possession sachets of suspected shabu (methamphetamine hydrochloride), and drug paraphernalia. The police internal affairs service is now investigating the shooting deaths of “nanlaban” suspects.